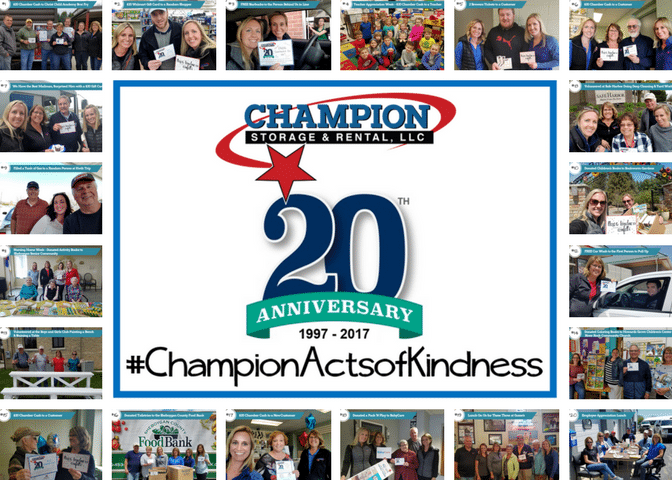 Champion Storage & Rental, LLC recently celebrated their 20th Anniversary on May 27, 2017. In honor of their anniversary they did 20 Acts of Kindness in the community throughout the month of May. Their acts of kindness ranged from giving Chamber Cash to customers, buying someone gas, donating items to Sheboygan Senior Community, the Sheboygan Food Bank and other local businesses. As well as volunteering at Safe Harbor and The Boys and Girls Club. To view all 20 Acts of Kindness please visit their Facebook page.